From the cool allure of the Avenue Matignon boutiques to the glittering elegance of the Opera house, Paris is a city that makes you crave the best of everything. It’s a city that thrives on its glamorous reputation…and is known for its high prices. 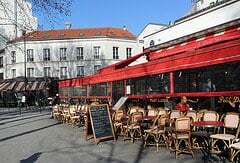 Restaurants: As any student can tell you, it’s easy to eat cheaply in Paris. But as tasty as falafels and panini are, they don’t exactly represent the best fare Paris has to offer. Instead, try Chartier, a Parisian classic dating back to 1896. Chartier has an enormous yet elegant 19th-century dining room and prices that keep it bustling. The soup of the day or a salad of grated carrots with vinaigrette dressing costs just over $1, with other appetizers averaging about $4 or $5. Main courses, including trout with almonds or the restaurant’s legendary roasted chicken, run about $10 to $13. Afterward, you can savor desserts such as Dame Blanche meringuée or Peach Melba for about $5. For classic bistro food and ambience, head to Le Bistro du 7ème (pronounced seti’yem), where you can get a delicious and copious three-course dinner, including, for example, a dozen escargots, duck confit, and crème brulée, for about $30. 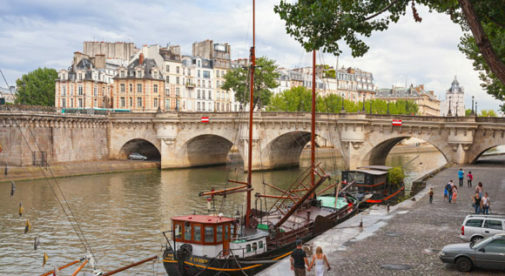 Museums and Attractions: One of the best things about Paris is that simply strolling along the cobblestone banks of the Seine or the tree-lined paths of the Canal St. Martin can feel like a wonderful extravagance, even though it’s absolutely free. There are dozens of other ways to enjoy Paris without spending a cent. Many major sites are free, including the Jardin du Luxembourg, Notre-Dame Cathedral, and the Basilica of Sacré Coeur. It also costs nothing to pay your respects to great talents such as Molière, Chopin, Jimi Hendrix, Jim Morrison, Gertrude Stein, and Oscar Wilde at the Père Lachaise cemetery. Take note also that on the first Sunday of each month all museums in Paris are free. About 22 museums, including the celebrated Musée Carnavalet (a Paris history museum), Maison Victor Hugo, and Musée de la Vie Romantique, are free year-round. If not free, then discounts are available for many attractions. Museum-lovers can save money by buying a “Paris Museum Pass.” A two-day, four-day, or six-day pass will allow you unlimited access to 60 museums and monuments in Paris, including the Louvre, Musée d’Orsay, Versailles, and the Arc de Triomphe. Prices start from $57, which means that by the time you’ve visited three museums or monuments, you’ll have already recouped your investment. Theater: French appreciation for the arts is legend. On any given day, there are dozens of theatrical productions and performances taking place around Paris…a few of which are even performed in English. Full-price tickets for sought-after performances can easily cost upward of $100 each. You can snag cut-rate tickets in a few ways. For most theater performances, you can get a 50% discount on tickets bought the same day as the show when you buy at Le Kiosque Théatre—special kiosks that only sell discounted, same-day tickets. These kiosks, located at Place de la Madeleine, the Parvis de Montparnasse, and Ternes, are open Tuesday through Saturday from 12:30 p.m. to 8 p.m. and from 12:30 p.m. to 4 p.m. on Sundays. For best results, go at least an hour in advance of the kiosk’s opening, if not earlier. Opera or ballet buffs on a budget can snag tickets at either of Paris’s opera houses, Opera Garnier or Opera Bastille, for as little as $8 to $14. Just go to the ticket office about two hours before the performance (the box office opens an hour before the show) and request a “category 6” ticket. Category 6 seats offer limited visibility, but it’s still an opportunity to enjoy a first-class performance for the price of a movie ticket.